Let's take a look at some of the world's "weirdest" architecture. Designed by Hondelatte Laporte Architectes and completed in 2012, this French building serves as a childcare centre. It features a number of animal sculptures, including a massive giraffe that appears to be walking right through the building. According to the architect, the idea behind the sculptures was to inspire imagination and creativity in the children attending the centre. The Dubai Frame is the world's biggest picture frame; 150m tall by 105m wide. This architectural landmark was conceived by Fernando Donis, who felt that instead of building another monument in Dubai, it would be more fitting to frame the existing monuments and emphasise the city's past, present and future. Controversy surrounds the landmark however, as while Donis was selected as the winner of a design competition by the Government of Dubai, he claims that the build went ahead without his receiving a contract or any compensation. Designed by engineer Andre Waterkeyn and architects Andre and Jean Polak, this atom-inspired building was originally constructed for the 1958 Brussels World Fair. The structure, which was chosen to depict the enthusiasm of the Atomic Age, features nine connected stainless steel-clad spheres, six of which are accessible by the public. An engineering feat, the building contains the fastest elevator of all time (5m/s) and was originally designed to last only six months. It now serves as a museum. Ilinden is a monument designed by artists Jordan Grabuloski and Iskra Grabuloska, constructed in 1974. The monument is dedicated to the fighters and revolutionaries who participated in the Ilinden uprising of 1903, as well as the soldiers-partisans of the Macedonia National Liberation Struggle 1941-1943. Inside the dome is the tomb of Kruševo Republic president Nikola Karev, as well as the bust of singer Toše Proeski. This giant fish-shaped building is (quite fittingly) the regional office for the National Fisheries Development Board, located near Hyderabad, India. The building, which was constructed in 2012, was inspired by Frank Gehry's "Fish" in Barcelona. A giant rotating teapot, this building is a Chinese exhibition centre designed to reference local customs. The building's rotating structure also allows it to serve as a micro roller coaster, ferris wheel and water park. Designed by architect Piet Blom, this set of tilted houses was designed based on the concept of "living as an urban roof". Cubes of conventional houses are tilted by 45 degrees and rest upon hexagon-shaped pylons. The purpose of this design is to optimise the space and have improved distribution of the rooms inside. 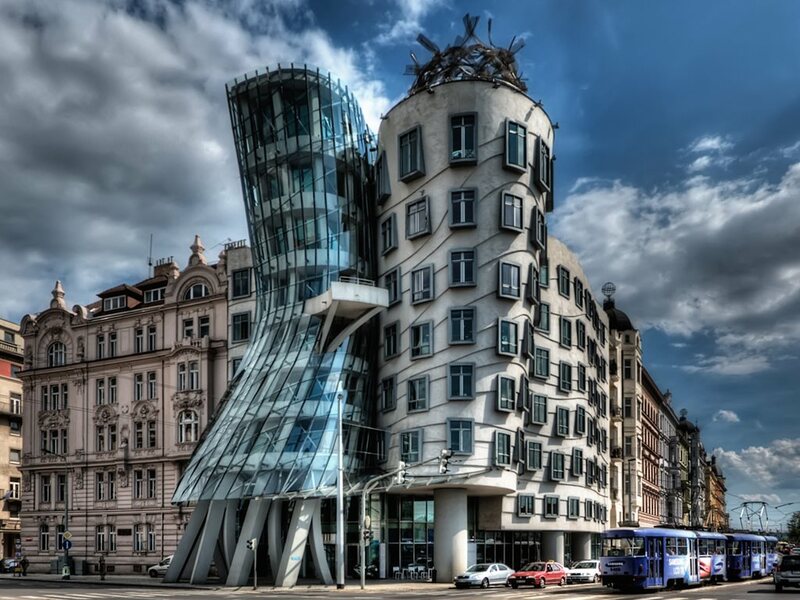 Dancing House was designed by Vlado Milunic in cooperation with Frank Gehry in 1992, and completed in 1996. It serves as the building for Nationale-Nederlanden, a Dutch insurance company. Its deconstructivist style (or "new-baroque") was controversial at the time because it stood out so much compared to the baroque, gothic and art nouveau buildings that Prague is known for. The Sharp Centre for Design is part of the Ontario College of Art and Design (OCAD). It was designed by Alsop Architects in a partnership with Robbie/Young + Wright. The building consists of a rectangular structure that sits 26m above the ground, supported by 12 steel columns. The building hovers over the oldest building on the campus, and is connected to an existing building by a lift and stair core. Designed by architecture firm Future Systems, the Selfridges Building is a landmark building in Birmingham. It consists of a steel framework with a sprayed concrete facade. Completed in 2003, the building has since become an architectural icon and is seen as having majorly contributed to the regeneration of Birmingham.